nightlight founder and executive director Ben Platz teaching about nightlight. nightlight’s story began in 2002 when Christa Platz, wife of founder Ben Platz, began working at a long term addiction care clinic in Guelph, Ontario. She reported what she had seen to Ben and challenged him to see the needs of the poor and addicted right in front of him. In the summer of 2003, Ben and Christa had a vision to claim inner-city Guelph for the Lord. In response, they assembled a vision team to help them explore the ways God might bring this vision to reality. In early 2004, the team concluded that a drop-in centre modeled on the Oasis ministry of Ray of Hope could best serve the vision they had received from God. Ben met with Oasis executive director Jon Hill to discuss ideas of how to run the proposed ministry. In conversation the two discovered that close to 30 years earlier, while Jon had been an addict, Ben’s father Stanley had taken Jon in and helped with his rehabilitation. After some months of consultation, Ray of Hope ministries offers to provide organizational oversight to the drop-in centre that would become nightlight. 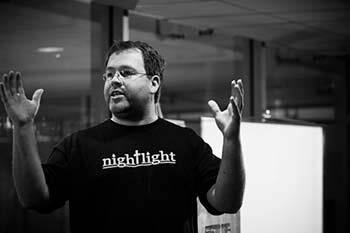 Ben is named executive director and on Nov. 8, 2004 nightlight is opened along the walkway in downtown Guelph. Many of nightlight’s volunteers were drawn from a single church, Royal Life Evangelical Missionary Church (EMC). When a united church in downtown Guelph folded, Ben suggested Royal City consider moving into their building to bring the congregation into closer contact with the community they were serving. Royal City EMC did just that and nightlight moved to the church’s basement. In January 2007 Royal City EMC took over organizational oversight from Ray of Hope. The Centre renamed the Royal City Christian Life Centre and still operates today under the name, The Life Centre. Around the same time, Ben and Christa felt called to international missions. They traveled to Lille, in France and opened up a drop-in centre among the predominantly North African Muslim population. The centre struggled because the very small Christian community meant there were few volunteers who could be recruited to staff it. The centre folded and in 2010 Ben and Christa returned to Canada and settled with Ben’s father in Kingston. After some months Ben attended a seminar on human trafficking where it was suggested that the problems of poverty should be addressed by government intervention. Ben began to question why the church had abandoned service to the poor to the government. He began to wonder if downtown Kingston could use a drop-in centre using the nightlight model, staffed by volunteers from local churches. In June 2011 a vision team was assembled to explore the viability of a nightlight in Kingston. In September of that year the team concluded that a nightlight drop-in centre should be opened in and on January 12, 2012 the centre opened at 666 Princess Street in downtown Kingston. During the period leading up to the opening of nightlight in Kingston, Ben had felt that the organization should expand to nearby Belleville. In December 2012, nightlight’s board of directors released Ben to explore the possibility of opening a new centre there. In March 2013 a vision brought together and affirmed a call of nightlight to the city. On January 14, 2014 nightlight Belleville opened its doors at 228 Front Street in downtown Belleville. In September 2014 nightlight received word that it had been approved for charitable status by the Canada Revenue Agency effective May 9, 2014. nightlight is now in the process of discerning what the ministry’s next steps should be.